As we have learned previously, reinforcement is a procedure that strengthens a behavior, and punishment is a procedure that weakens behavior. When dealing with positive punishment it can tend to get a little confusing. The work positive means that a behavior is followed by the presentation or addition of something “positive”. In this situation, the word positive when it is paired with punishment, does not refer to good or pleasant, it just means that the response resulted in something being added or presented. Resulting in the delivery of something the person or animal hates, this will result in them being less likely to behave that way in the future. When dealing with word negative, this is referring to the removal of something, this scenario would be the subtraction of something from the situation. In simpler terms, the word negative does not refer to something bad, it is referring to a response resulting in the removal of something. For example, if a child is acting bad their toys will be taken away. To sum this all up, in this situation when dealing with the word positive punishment the word positive only means that the behavior has resulted in something being added, and the word punishment means that the behavior will decrease in strength. If a situations consequence weakens the behavior this would-be punishment. You had very clear explanations on both positive and negative punishment. It was very knowledgable, and easy to read. Also did you know that both negative and positive punishment have certain scenarios in which one is more effective than the other. for example, when you are showing a child right from wrong, sometimes the best way to get the message across without harming the child is negative reinforcement. 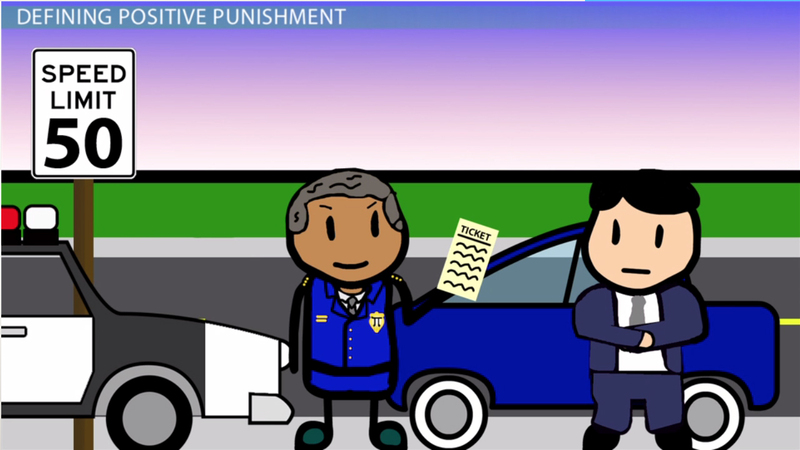 But if we are talking about positive punishment, the cop cartoon is a great depiction of that. Giving some one a ticket that they will have to pay for is a great way to get the message across that they might want to change their driving habits. Not only was your post really clear like Nicole said, but it was well-written. I enjoyed how you emphasized the differences in vocabulary words and provided solid evidence. Truly, I liked what you had and all the additional information was just wow~good luck with the rest of the class.I think it's near the end of the class! All of us have done such a great job. We all should be proud of ourselves I have to say. Well see you! Can an Animal Actually Count?